Elgin, was pronounced with the hard g instead of the Eljin which seems most common today. It is located west of the junction of King George Highway and Crescent Road. J. Alex McDougall and his family pre-empted land on both sides of the Nicomekl River. He named the stopping point where the Semiahmoo Trail crossed the Nicomekl River, Elgin, after the place in Scotland where he was born. Elgin was one of the early centers to develop as a settlement focus in Surrey. Mud Bay is the agricultural area associated with Elgin. The first pre–emptions of land in Surrey were not until the 1860s. The flood of Americans in the 1858 Fraser Gold Rush instigated Governor Douglas to make the Pre–emption Proclamation. That same year, 1860, James Kennedy was the first to pre-empt on the north side of Mud Bay. Samual Hardy, second, and Hugh McDougall, third, both on the south side of the Nicomekl River in 1861. Both Hardy and McDougall appear to have left by the time of Municipal incorporation in 1879. 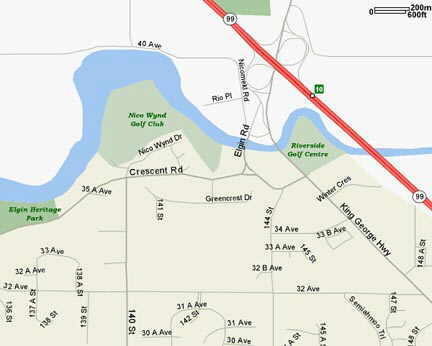 Crescent Road Corridor Report to Surrey by Brian Guzzi & Associates, Landscape Architects. Former Dominion Archivist Dr. W. Kaye Lamb explained how Elgin was named. "It was named by my uncle Will (W.C. McDougall). My grandfather Alexander McDougall and family were amongst the very earliest homesteaders in that part of Surrey, and their land lay on both sides of the Nicomekl River. 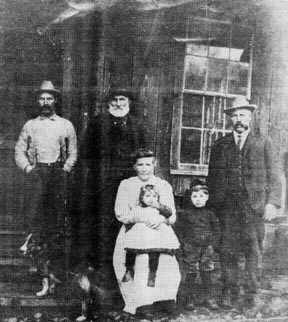 When grandfather arrived in 1873, the total population on the south bank of the river in the Mud Bay area consisted on one family named Hazelton and three single men." Three factors were responsible for Elgin's development: local logging operations; its importance as a stage stop along the Semiahmoo Road; and the establishment of a customs' entry port. Located at the junction of the Nicomekl River and the Semiahmoo Wagon Road, Elgin had become a center for logging operations as early as 1872. In that year William (Billy) McDougall arrived with his family to establish a small hand-logging operation on the uplands around Elgin. He obtained Timber Lot 17 by Crown Grant on the east side of the Semiahmoo Trail, south of the Nicomekl in 1887. The western side of the trail in Elgin had been taken up as Crown Grant in 1884 by Donald and Finlay Stewart, brothers of John Stewart. For many years after this, Elgin provided the booming grounds for all logging operations along the Nicomekl. Logs were sorted and boomed in the Nicomekl River just west of the Semiahmoo Road Bridge. Elgin was Surrey's most important port on the Nicomekl for transshipment of supplies, and sorting and booming of logs. As Edna Loney noted, "In those days the Nicomekl River was the main highway. Freight steamers running with the tides, so as to be certain of deep water at private docks, would pick up passengers and farmers' produce at all hours of the early morning." 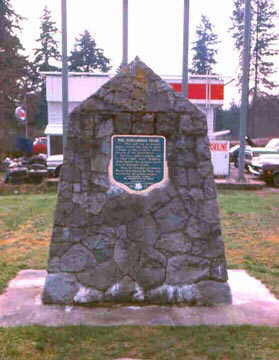 A monument was established in Elgin just north of the Esso Station to commemorate the Semiahmoo Trail and the McMillan Expedition as it passed the site of Elgin in 1824. This Hudson Bay Expedition was sent north in the winter of 1824 to located a site for a future Fort Langley. 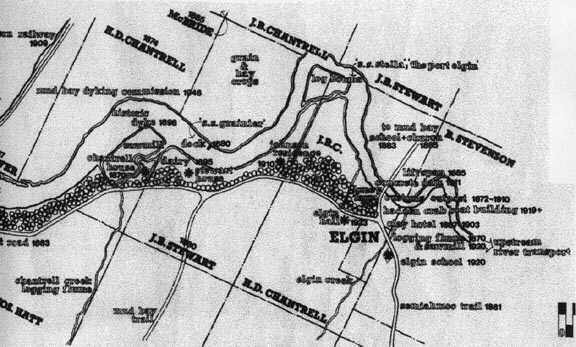 Elgin was chosen as the site for the monument as the Nicomekl River cut the Semiahmoo Road at Elgin. In 2008 the monument was moved just west of this location. 1873 was a most important year for the little community as work was progressing on the road from Brownsville, on the south bank of the Fraser River to Semiahmoo (the present Blaine). With the opening of the road other families followed; the Chantrells 1873, the Stewarts 1880, the Stevensons and the Loneys 1890. 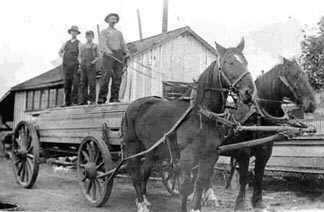 Other pioneers who contributed to the development of logging around Elgin were the Ropers and the Gilley brothers. "At Elgin, the Loney men were bridge tenders and the span would be raised by two or three men walking around and around for 20 or 30 minutes pushing an iron bar attached to two cables to lift the draw. Boats could then proceed up as far as Hall's Prairie Road, near Cloverdale, to pick up cargo and bring out booms of logs for New Westminster and Victoria markets." "In 1880, John Stewart, 38 years old, bought the Samuel Hardy place on the Nicomekl River and over the years acquired two more farms on the north side of the river. His house was built c1895 on the uplands south of the Nicomekl River. Stewart served as a Surrey Municipal Councilor from 1884–7, and 1892–3. While John Stewart's brothers, Donald and Finley, were in the Surrey area earlier, they did not settle as farmers. 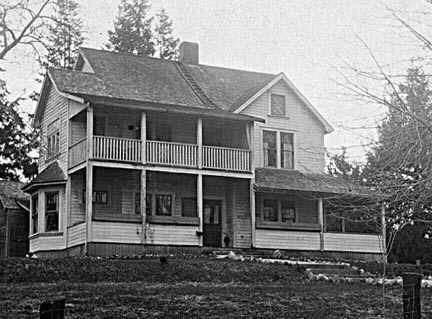 In 1884, they acquired the Crown Grant to Timber Lot 18 on the west side of the Semiahmoo Trail in Elgin, selling it ten years later in 1894 to the Loney Brothers (John, Edward, James) at about the time John's house was built down the road. Elgin's position as a stage stop along the Semiahmoo Road began in 1874, just after the opening of the road. A daily mail stage between New Westminster and Semiahmoo, Washington was inaugurated but was forced to stop in the spring of 1875 because of fallen trees across the road. A twice-weekly stage service was re–established in 1878 and this operated until 1891. For the benefit of passengers a six-room hotel was put up at Elgin, and with its barn and blacksmith's shop it provided a rest and watering stop for the teams before the long six-mile pull over the southern uplands to the St. Leonard hotel on the International Border at Blaine. The Elgin Hotel also housed a country store and an attached post office to service the immediate community. However, the hotel languished after the stage service was terminated with the opening of the New Westminster Southern Railway in 1891. The Elgin Hotel was an important rest stop on the Semiahmoo Road. The hotel with its barn and blacksmith's shop also housed a country store and an attached post office to service the immediate community. The hotel, the barn with blacksmith shop, were located on land between the King George Highway and where the Semiahmoo trail is marked by a cairn on the south bank of the Nicomekl River. Mabel Steveson's home was built virtually on the old hotel site. In the picture are the Hadden children. Norman is on the left, Margaret Jean on the right, and young Virginia in the centre. The hotel came down in the mid 1940s. In 1880 Elgin was designated as a Canada Customs entry port and from then on all traffic, on the Nicomekl River and along the Semiahmoo Road, was required to stop and report. The Customs House was located on the south shore and on the northwest side of the road next to the river and is seen in this picture. Port Elgin was designated an Out-Port of New Westminster. The first customs officer was William McDougall, who served until 1886, when Harry D. Chantrell took over. With the construction of the coastal rail line, the Customs Port of White Rock came into being in 1908, with offices in the Great Northern Railway Station. This port and the Port of Douglas on Coast Meridian Road made the Customs Port of Elgin redundant. At its height Elgin contained a hotel with a barn and blacksmith shop, a Customs House, a community hall, a school, and a sawmill which was operated by the Hadden Family. The earliest preemptors in the Elgin–Mud Bay area were Calib Pike, William Pike, Harry Chantrell, Stuart Stevenson, John Stewart, Alexander McDougall, William McDougall, the Hazelton family, Edmund Wade, and William McBride. The original Stevenson home in Elgin is on the left. The first home was a two storey rough board dwelling. Ben, brothers George (visiting from Toronto), Stuart, and (seated) sister Maggie with two of Ben's children. On the right is the Edward Loney home. Built in 1905 at a cost of $10,000 this 14 room house at Elgin was used for years as a social centre. It burned down in 1932 and a traditional way of life in the community came to an end. Stuart Stevenson built a second home on the south side of Crescent Road just south of the Esso Gas Station where the road turns sharply just west of 144th Street or Archibald Road. 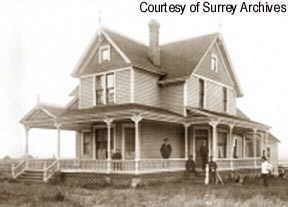 The Loney brothers, (Edward, John and James) arrived in 1891 and settled down close to where the Nicomekl River runs west of the Semiahmoo Trail. Here they established their Elgin farm raising mainly dairy cattle and grain. Once part of the pioneer Chantrell homestead, the John Loney's farm was located on Mud Bay Road east of the Great Northern Railway line. Ed Loney built a large 14 room home west of the Semiahmoo Trail and along the Nicomekl River. It was destroyed by fire in Nov. 1932. James married in 1895 and left the partnership to establish his own 320 acre farm along Johnston Road in the Sullivan area. Ed Loney had a gas pump and a garage on Crescent Road on the south side of his property during the early part of the last century. Frank Loney was the mechanic and his wife Edna was the bookkeeper. The garage was very popular with the Model "T" owners because what couldn't be hay wired together, Bill Hadden could make the needed part in his machine shop. 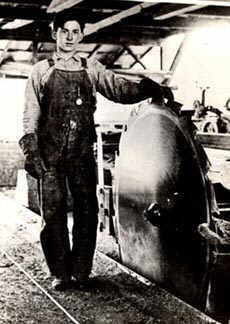 After the turn of the century Elgin's first sawmill, was established by the Hadden Family. It operated just east of the present river control gates, in the vicinity of the old Billy Hadden home. The Elgin Mill operated from 1906 to 1917. It burned down in 1917 forcing its closure. This was in the vicinity of the old Elgin Hotel. 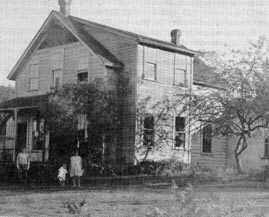 The Hadden Family milling operation began in Cloverdale. Cloverdale Milling Company was opened in 1900 by James and David Hadden and operated until 1908. They later took in a Mr. Laking as a partner. The lumber mill was located on what is the north east corner of 60th and Highway #15, the Senior Centre on part of the Fairgrounds complex. The Hadden Mill was electrified and it supplied the first electrical system in Cloverdale. In October 1902 several homes near the mill were connected to the mill's dynamo thereby acquiring electric light. It is believed that Hadden supplied the electricity free of charge and it was usually lights out during the early evening; 8 to 9 pm. David Hadden also opened a second shingle mill a block south of the original Hadden Mill on King Street. James (Jim) Hadden is the Elgin pioneer who started the planer mill. Bill Hadden was his son. Bob Hadden was Bill's son. Here James (Jim) is pictured with his wife Laura. 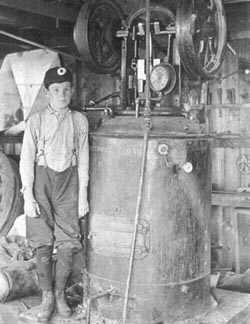 Young Billy Hadden is pictured next to one of the mill's boilers. This was part of the power source for the mill. 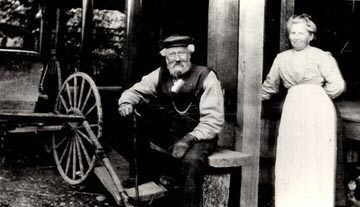 An older Bill Hadden is pictured beside the mills head saw. It was capable of handling large dimensional timber. 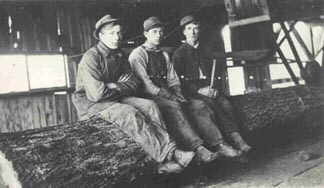 Stuart Stevenson with Billy Hadden and a mill worker or possibly one of his brothers with a load of lumber for Stuart's home that is pictured and described above. 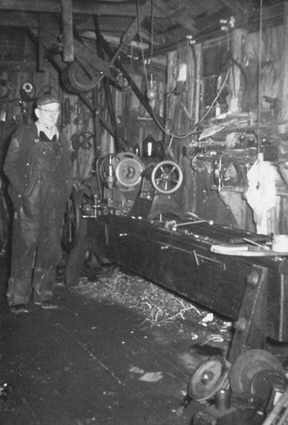 William (Bill) Hadden is shown with his metal lathe. This metal lathe was built on a wood bed. Bill could produce a variety of metal products in his shop. The lathe currently resides in the Surrey Museum. The little Elgin United Church was built by the pioneers in 1885. It was located along the Semiahmoo Road at Wade Road (King George Highway and 44th Avenue). 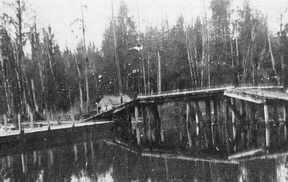 It was built with lumber floated down the Nicomekl River. Torn down in October 1966, it is presently the site of Art Knapp's Nursery. 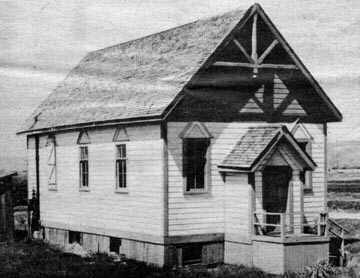 Mud Bay School was built across the Semiahmoo Road from the United Church in 1883. It operated as a school until 1921 when it was closed for health reasons. It reopened during 1929-31 as a manual training centre. It had been a tramp shack during the 20s, but students cleaned it up to operated again as a school. The manual training teachers were Mr. Johnson and Pop Leonard. 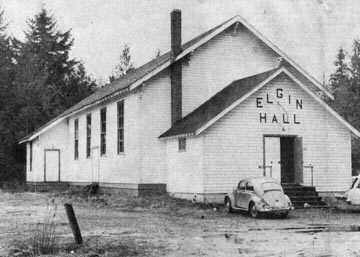 Elgin Hall has been a social centre for the community of Elgin since 1922. 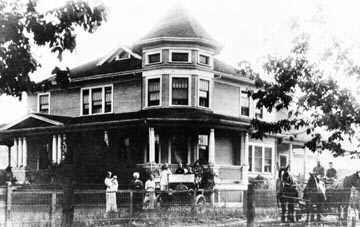 Starting April 3, 1922, as the Get–Together Club with George Falk as president, Henry Oxenbury, vice-president, Christine McIver, secretary, and Savoy Hennessy, treasurer (with the object of building a hall), the people of Elgin began with land donated by pioneer Daniel Johnson. For the purpose of registering the property and to raise a mortgage for the building the name was changed to the Elgin Community Association on November 19, 1922. The first executive included Allan Johnson, William Stewart and Ed Dinsmore, directors; Cecil Lamb secretary-treasurer and George Dinsmore, president. An active group, the original members worked hard to start the ball rolling. Everyone in the valley and on the hillside pitched in to help clear and grade the land for the hall, and to raise money through concerts and other events held in private homes. The building committee was asked to bring in quotations for materials needed. Lumber was hauled from King Farris Mill and orders placed with Surrey Dyking Commission (for sand and gravel), the Campbell River Lumber Company, Browns' Transfer, Gilley Brothers and T.S. Trapp. Through 1922 the hall was built by one carpenter, Chris Anderson, with volunteer help. 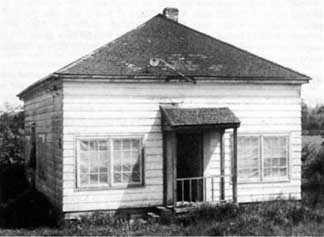 The opening date of the hall, at 14250 Crescent Road, was set for March 23, 1923. Arthur Peck's orchestra (six pieces) was engaged at a cost of $45. A cook stove was purchased from Fraser Valley Co–op in Cloverdale, and the old wood stove from Elgin school was borrowed for the occasion. As a dance was planned, several gas lamps were purchased as well as a piano and placards to announce dates. Elgin Hall was in operation. In April 1923, $1,750 was borrowed from William James Stewart of Crescent Beach on a three-year mortgage agreement at eight percent interest. At this time the property was valued at $20, the building $3,300 and furnishings $475. Fire regulations for insurance purposes necessitated the clearing of more brush around the hall. Dances, box socials, and concerts were held regularly to raise money for the hall and for repayment of the mortgage. Membership over the years from 1924 to the early 1930s varied, but generally there was between 20 and 30 members. In 1932, the association became dormant through lack of membership and between that time and 1943 the hall reverted to the municipality for taxes ($255). That same year, 1943, with the Hungry Thirties behind them, the old-time spirit of the Elgin community again rallied. A deal was made with Surrey Council to settle for the sum of $200, subject to release of the mortgage held by Stewart. A drive for funds raised $273, and the hall was brought back to its original ownership. Over the years the hall has been the scene of a wide variety of get-togethers. Now protected under the Heritage Act Elgin Hall will remain to serve generations into the future. The White Rock and Surrey Sun. Elgin Hall becomes local heritage site. Margaret Lang Hastings. Tuesday, Dec. 30, 1980.